My favorite city, Istanbul, has had its ups and downs this summer thanks to the Turkish government. One of the positive highlights happened on August 27, when a local shopkeeper, Hüseyin Çelikel, set out to paint the 100+ steps leading from Fındıklı to Cihangir in rainbow colors. This was not a political statement. He just wanted to brighten up people’s day. At first, Çelikel painted only three of the steps, but then, after positive comments from passers-by, he decided to paint them all. Soon, residents were posing for picture on these colorful steps. But this happy moment was shortlived because the local municipality quickly took action and repainted the stairs an ugly, boring grey. Of course, this act of grey-ing the rainbow stairs soon triggered more anti-government protests in Istanbul and across the country. Shortly afterwards, the municipality (smartly) decided to repaint the Fındıklı-Cihangir in its former rainbow splendor. In the past month or so, the movement of painting rainbow staircases has spread all over Turkey from Ankara to Yalova and Antalya to Gaziantep and even N. Cyprus. I set out to find the rainbows myself during my recent trip to Istanbul. Following the tram route from Kabataş, I got off at the Fındıklı stop and walked south towards the Tophane stop. In between these two tram stops, you can’t miss the uneven and rundown steps that are painted in bright rainbow colors. A cat posed in front of the steps for me, and four young, German tourists asked me to take their photos while I was there. As I had the afternoon to myself, I leisurely walked up the steps to take a bunch of photos. I found tons of colorful graffiti on the walls here as well. Later in the week, I moved over to the Asian side of the city and strolled around the neighborhood of Kadıköy where I found a few more rainbows near the main square. Left: Part of the Cihangir steps. Right: More painted stairs in Kadıköy. 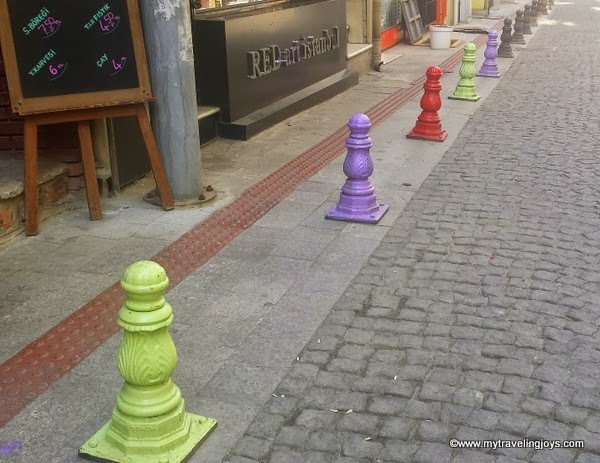 Random street posts painted in rainbow colors in Kadıköy. In a city that is full of contrasts, I think it’s wonderful to see these rainbows brighten up some otherwise less colorful parts of the city. I can only hope these rainbows will remain. 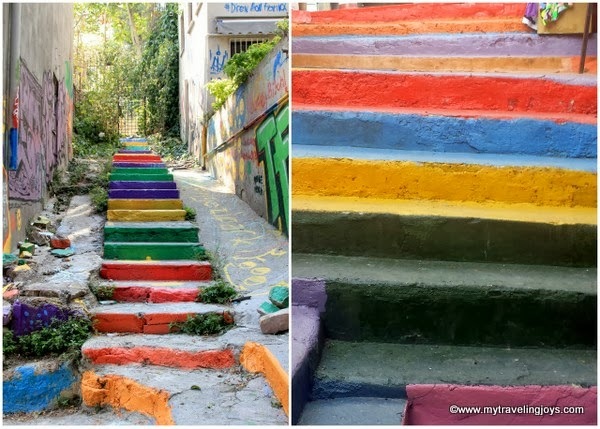 The "controversial" rainbow-painted steps leading up to Cihangir. A second set of rainbow-painted stairs leading to Cihangir. Of course, the Turkish police are stationed nearby so things don't get out of hand at the rainbow-painted steps. Boo! If you are on Twitter, look for the hashtags #direnmerdiven and #direngökkuşağı to find more rainbow-painted staircases across Turkey. ‘Diren Merdiven’ on Moe’s blog: Passion Taking Flight. More photos can be found on the Turkish Rainbow Revolution website. what a cool idea! i live in the city of steps and it would be so neat if someone did this here. The rainbow painted step look really great. We saw these step on our way to Istiklal street (so I think). I must say the city is simply amazing so is the rest of turkey we visited. I would like to back here soon. @Bergamot, thanks! There's so much to see in Istanbul and Turkey. We loved exploring there! What a great post, and a quiet commentary! That's a beautiful story, Joy! 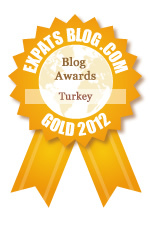 Makes Mrs Romance and me want to go to Turkey even more. @Mary Ann, Thanks for stopping by! Thank you Joy for this colourful insight! @Hi Anne! I wonder if the Turkish gov't re-painted the stairs gray again or not. I wouldn't be surprised if they did! That's one of the joys of Istanbul - you turn a corner and you never know what you may uncover. I'll be back again in about 9 weeks for a visit. Yay! Never knew these existed in Istanbul. So cool!